Becoming a mother is a whole new experience and it indeed brings its joys along with. And with the joys comes responsibility. If you are going on a trip with your newborn, it can be pretty difficult to decide on what things to pack for the convenience on road and at location. While it is true that you get most of the toiletries and medications around and there’s no need to pack loads of them, it is still safest to stock a decent amount of necessary things. It comes handy and there’s no hurry to find all the things in a new place. Small packs of toiletries: It is best to pack small travel or test packs of toiletries you use for your baby. If you plan to buy it on location, you might not get the exact things you use and then you will have to carry them back anyway. So, just get pouches or small 50/100ml packs of lotions, sanitizers, soap, etc. Diapers: Diapers are one necessary thing to pack while on the go. At least pack some for the first couple of days if you plan to buy the rest once you reach the place. If you use re-washable diapers, you might consider giving it a break for a few days as it would be difficult to properly dry them in hotel rooms when travelling. Food: If your baby is taking formula milk, you should carry it along. Also, plan logistics on from where you plan to get warm milk and other things required for the feed. Also, carry the bottle cleaner and soap with you. Carrying the baby: If you think it would be easy to carry your baby around as you have been doing so for everyday errands, you need to think again. 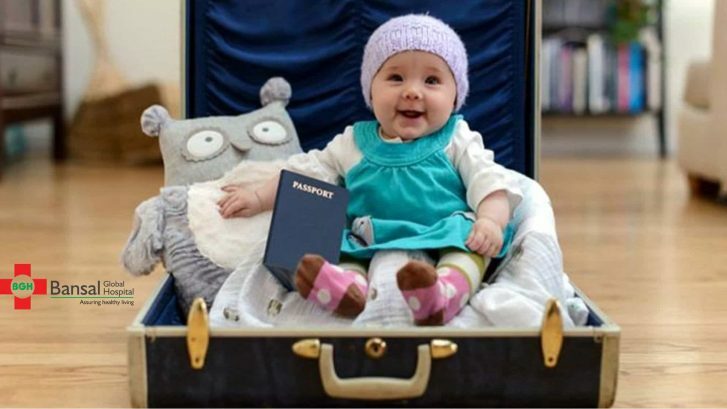 It is not easy to carry a baby while travelling and it might exhaust both you and the baby. Prefer a comfortable stroller which can be carried easily and have covers for excess sunlight or insects. The most important thing is your baby’s health. If you are traveling to a new place with the different climate, visit your pediatrician and get a prescription for medicines which might be required, in case. You should also get your child vaccines against any disease which is widespread in the area. For more information, visit Dr. Neha Bansal, our in-house pediatrician and new-born specialist. Book an appointment directly at the BGH help desk or send us your queries online. A world-class private hospital located in North-West Delhi, the Bansal Global Hospital offers the best treatment possible and care to its patients round the clock (24×7). The multi-specialty Bansal Global Hospital provides specialist medical and surgical care ranging from simple day-case procedures to complex surgeries, blood and other tests in our state of the art pathology lab, digital X-rays, inpatient facilities. The hospital has a dedicated inpatient facility, with all fully air-conditioned ensuite rooms. Our staff offer high-quality services to ensure that your stay with us is as comfortable as possible in private and discrete facilities.